Despite a premise that feels ripped from today's headlines, the debut film from writer-director Henry Dunham works as both a tense reflection on these times of gun violence and an effective study of something far more timeless. A synopsis for The Standoff at Sparrow Creek reads as conveniently topical. News of a mass shooting, a gun cache, anxious white men in middle America—the political touchstones are there for a ripped-from-the-headlines message movie. But do we really need to learn again about how guns are bad? Fortunately, as the plot of writer-director Henry Dunham's debut feature film cinches together, it becomes something else. Call it a meditation on a certain mindset, or just consider it a crackerjack whodunnit, this is a tense, mean little film with something to prove. After hearing echoes of gunfire in the distance somewhere in rural Michigan, ex-cop Gannon (James Badge Dale) knows something is amiss. It sounds like an assault rifle, so off he goes to his militia's warehouse headquarters to convene with the rest of his crew. Given its brief runtime, The Standoff at Sparrow Creek ramps up quickly from there, moving from Gannon's isolation to introductory scenes of rapid-fire dialogue. We learn the particulars fast: this militia consists of seven men of various ages, all sharing the same paranoid worldview. Putting two-and-two together, they move into high alert; turns out the shooting was an attack on a police funeral, and what's worse, one of their guns is missing from the armory. These men now need to find out who pulled the trigger, or the cops will find an excuse to come down on them. Given a militia's usual purpose as something akin to a survivalist resistance force, this is either an ironic turn of events or destiny fulfilled. Since the story is set largely in a single warehouse, and its cast fires off more lines of dialogue than bullets, an obvious point of comparison is Quentin Tarantino's Reservoir Dogs. As in that film, the central concern is in discovering the one character who is not who they say they are. This is a superficial link, however. Where Tarantino sought always to underline his style, scoring his debut film with incongruent and catchy pop tunes, Dunham works as a minimalist. He torques his filmmaking via incisive editing, stark lighting, and a seemingly bottomless silence. 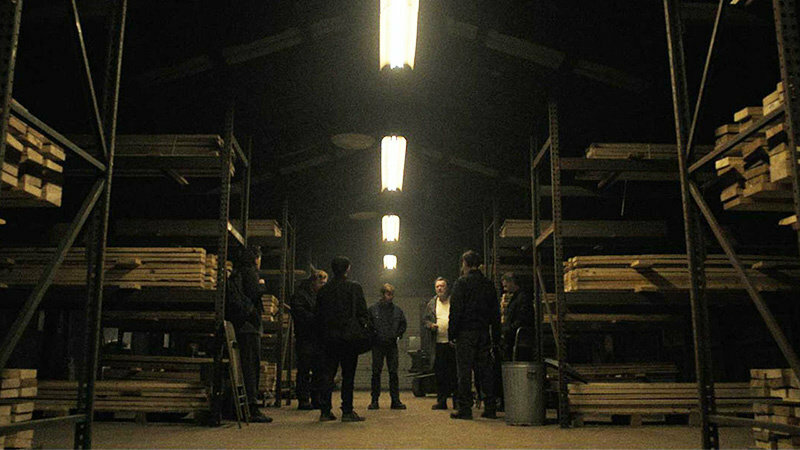 The men of The Standoff At Sparrow Creek are left with just the echoes heard in their warehouse, wind howling through dead trees, the boom of a gun—all in darkness and shadow. In that atmosphere, the film's twists catch us off guard, as they do the characters. A more apt comparison, then, might be John Carpenter's 1982 masterpiece The Thing. The two films share a similarly warped worldview, with all their men (it's only men, of course) both isolated and scarily proficient—until something overwhelms them. In both cases, we only ever know these guys by their last names. Let's say The Standoff at Sparrow Creek is something like The Thing, but without the alien. Dale as leading man is no Kurt Russell but his presence has a similar effect here. Never certain as to his allegiances (to himself, the militia, or the cops), Dale plays Gannon as the right man for the job. It's the type of role he's often excelled in—the slippery sort, competent but with an edge. Even his good guy roles (as in AMC's short-lived Rubicon) find him as a man with skills, and something to hide. He has the respect of the militia, and he's put in charge of their in-house investigation, but we have our doubts. Likewise, Dale leads a fine cast of character actors, including familiar faces Brian Geraghty, Patrick Fischler, and Gene Jones. What we learn about each character is enough to fuel our imagination; how each is used in the film, and how each actor breathes them to life, is more than enough to power the plot. For a film as tightly made as this, peering into the presumably well-guarded lives of militiamen, it's fair to assume Denham has taken liberties. Aiding this perception, The Standoff at Sparrow Creek is often schematic in its construction, like we're supposed to be impressed by the tight clockwork of its writing and effectively slick aesthetic. It can feel like Denham's film is more the product of his personal cinema synthesis than any real-world research or experience. That aforementioned synopsis reads as convenient because to be blunt, it's the kind of eye-grabbing thing a first-time feature filmmaker would seize upon. It's also a cynical, even paranoid, way of looking at this film. 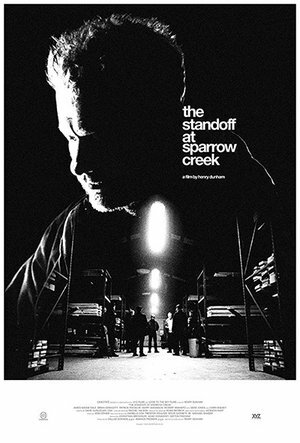 In practice, however, The Standoff at Sparrow Creek doesn't function like that. Denham instead sets up a situation allowing for the study of a certain subset of masculinity—the angry ex-con, the old man loner, the disgruntled teen—using language as his primary tool, rather than violence (though there that, too). We're made to consider more primal concerns, feelings that go far beyond the mere desire to own a gun. Like its forebear The Thing, The Standoff at Sparrow Creek is a genre film that eschews the current political climate, which is precisely what allows it to reflect any political climate. In its spikes of terror, its glimpse into a void between order and chaos, its basic ticking suspense, it effectively approaches the timely subject matter of gun ownership and gun violence —but it also creates something timeless.